Charles E. Albert was the son of my paternal grandfather’s first cousin – making Charles my 2nd cousin once removed. His parents were Georgia Anna Amore and John Albert. Charles was born on February 14, 1922 in Coshocton county, Ohio. On February 4, 1943, Charles enlisted in the US Army at Columbus, Ohio. While serving in Italy, he was killed in action on October 6, 1944. Ward L. Goul was my 2nd cousin twice removed – the son of Jesse L. Goul and Alice Edna Rodgers, nephew of my great-great-grandmother. He was born on December 15, 1891 in Marion county, Indiana. Ward enlisted in the US Army on August 31, 1914 at Anderson, Indiana and sent to Columbus, Ohio. He was transferred to the Coast Artillery School in Fort Monroe, Virginia and went overseas in March 1918 where he as assigned to the 56th Coast Artillery. After receiving wounds in battle, he was at Evacuation Hospital No. 28 where he died on January 25, 1919. Sgt. Ward Lester Goul was buried at the American Cemetery in Nantes, France and later repatriated to America. His final resting place is at Grovelawn Cemetery in Pendleton, Indiana. Frank A. Given was the oldest son of Ivan Andrew Given and Helen Kirk. He was my 3rd cousin – the great-grandson of my maternal great-grandmother’s sister, Rachel Blazer Given. Frank was sent to Viet Nam and arrived the end of December 1962. He was assigned to Delta Company, 1st Battalion, 3rd Marine Regiment, 3rd Marine Division. While returning to his unit from R&R in Hong Kong, his plane crashed into the Bay upon taking off. Pfc Frank A. Given is buried at Memorial Park Cemetery in Kansas City, Missouri. Forrest Milton Ogg was my 4th cousin. He was born to Herbert H Ogg and Edna E Brenner on June 7, 1920 in Minnesota. He is descended from my 2nd great-grandmother’s sister, Mary Ann Reed Orr. He entered the Marines while living in Michigan. He was killed while in WWII on June 19, 1944 and interred in the 4th Marine Divison Cemetery, Saipan, Marianas Islands. Later he was removed and buried at the National Memorial Cemetery of the Pacific in Honolulu, Hawaii on February 16, 1949. Sgt. Forrest Ogg has his name on a memorial wall in Saipan. On this Memorial Day, I remember those collateral relatives who paid the ultimate price in order to protect the freedom we have in this great nation of ours. My second cousin once removed, Charles E Albert died in Italy on October 6, 1944 during WWII. Charley enlisted in the Army on February 4, 1943 at Columbus, Ohio. Three weeks after his death, his mother, Georgia Anna Amore Smith, received a telegram that was delivered by the Adjutant General, J A Uho. It read that Charley was killed in action. He was survived by his mother, stepfather William Smith, and ten siblings. He is buried in Greenfield, Ohio at Greenfield Cemetery. My second cousin twice removed, Ward Lester Goul, died from wounds received in battle during WWI. He died on January 25, 1919 at the Evacuation Hospital and was buried at the American Cemetery in Nantes, France. Ward had been assigned to the 56th Coast Artillery after he was shipped overseas in March 1918. My first cousin, James Amore, did not die during battle but during his service in Viet Nam, he was exposed to Agent Orange which caused him to die at a young age. Jim (or Bill as I called him) was the son of my uncle Paul Amore. He was born in October 1946 and died May 17, 1974 at the age of 27 years. May we never forget those who served and died in order to keep our country free. My parents, brother and sister called Green Park apartments in Tokyo, Japan their home for a short time when they lived overseas in the 1950s. Built around 1953, the complex had everything families would need under one roof – a post exchange, a movie theater, club for teens, etc. My grandfather, Glen R. Johnson, was transferred to Wiesbaden, Germany in 1950 (before the Army Air Corps became the Air Force). 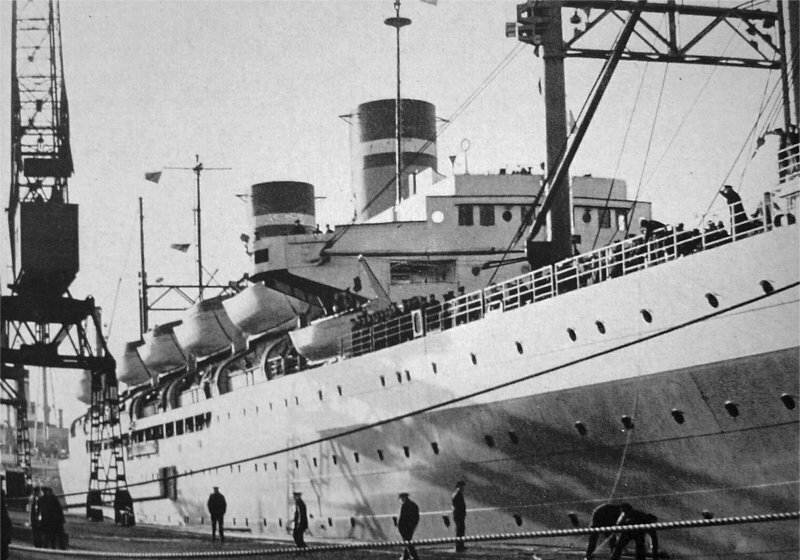 Upon arriving at the Port of Bremerhaven aboard the Gen. Patch on July 20, 1950, the U.S. Band greeted him and my grandmother, Vesta. 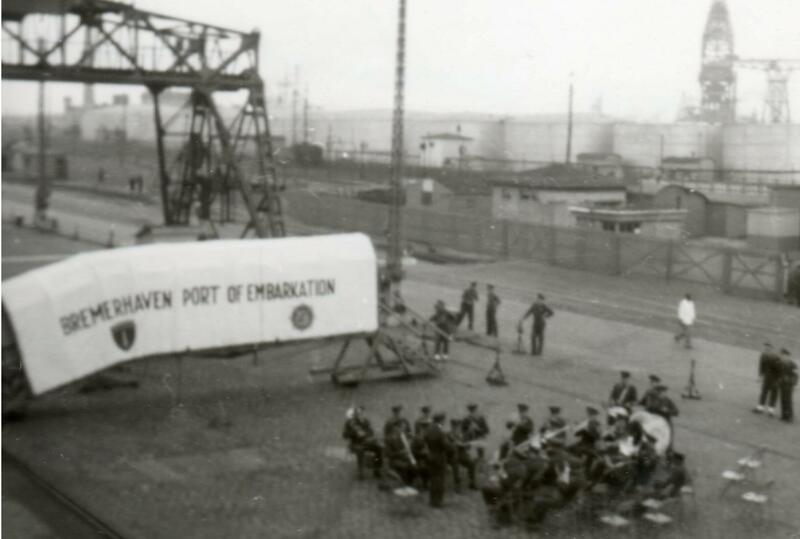 Wikipedia says that Bremerhaven means “Bremen’s Harbor” in Bremen (which was in the free Federal Republic of Germany). Luckily, while they were in Germany, they were able to take side trips to other places on the weekends. 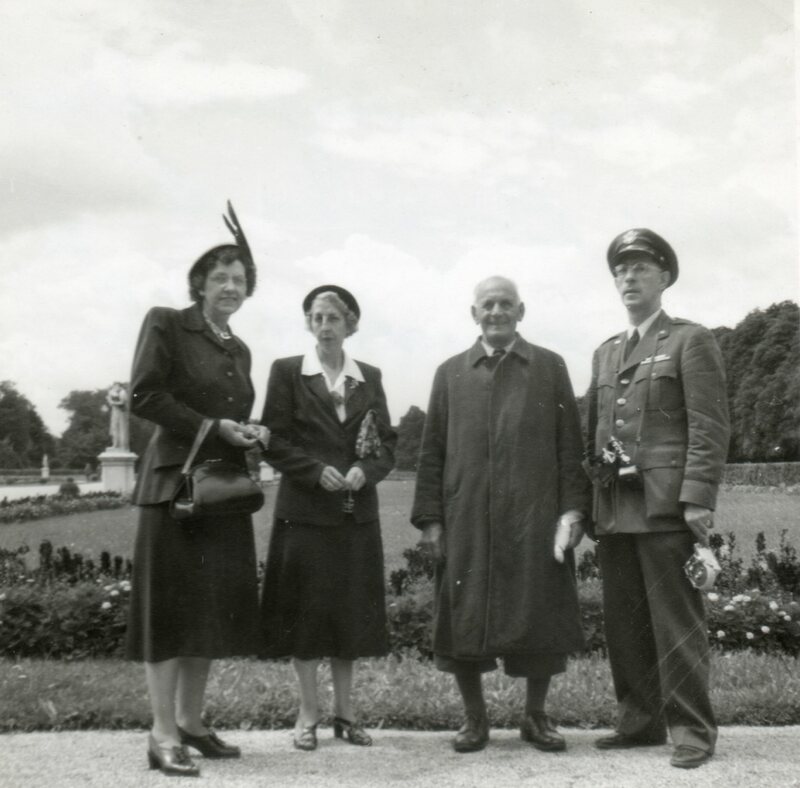 The picture above was taken on August 5, 1950, when they went with another lady, Mrs. Mulligan, along with a Bavarian guide to see the Nymphenburg Castle, Home of the Bavarian Kings. Besides all of the photos, I also have several years’ worth of letters my grandparents wrote my parents. Those letters detail all the little trips around Europe they took as well as their day to day life in Wiesbaden. Last summer I found a large quantity of postcards that had once been in my grandfather’s collection which my mother had put away. I brought them back home with me. Most of them showed scenes of World War I or buildings in Europe. Most were black & white. A few, however, were tinted. The following three postcards show (what appears to be the same) soldier and young woman “pining” for each other. On the bottom right of the first two are: DIX 975. The bottom left of the last one is: FURIA 2071. Apparently, these cards were made in Paris, but with the American Flag in the third one, leads me to believe they were American Patriotic cards produced for the Americans fighting in France to send home to their sweethearts.